The highest density of Algonquin wolves are found in Algonquin Park. 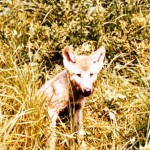 Fawn-coloured pelt with long black hairs on the back and sides and a reddish colour behind the ears. Adult males weigh between 25 and 35 kg and females weigh between 20 and 30 kg. A “pack” animal, found in groups usually of 3-6 adults. Each pack has a home range that is loosely defended from neighbouring packs. A territory can be up to 500 square km in size (average typically 150 square km). Feeds on white-tailed deer, beaver and moose, as well as on caribou in the northern part of its range. Predators include people, bears and other wolves. Two leaders of the pack (the alpha male and alpha female) mate in February. Pups are born approximately 63 days later in a den which has been dug into the ground. Generally 4-7 pups are born per pack. Pups are nursed for the first six to eight weeks. Once weaned, they rely on the other members of the pack to feed them. Deciduous and mixed forests in the southern part of its range and mixed and coniferous forests further north. Require relatively large areas of unbroken forest. Habitat loss as a result of forest clearance and farmland/residential development. Genetic studies show the hybridization between Algonquin wolves and coyotes could be a long-term threat to the genetic integrity. Year-round closed hunting and trapping season in and around Algonquin Provincial Park. 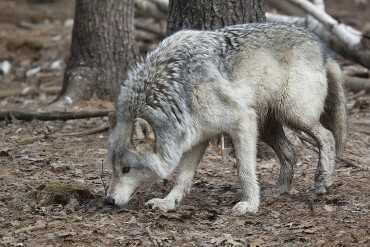 Closed hunting and trapping season from April 1 to September 14 across core wolf range to protect wolves raising young, a requirement that hunters purchase a wolf game seal with a limit of two per year, and mandatory reporting by hunters and trappers and by persons that destroy a wolf in protection of property. 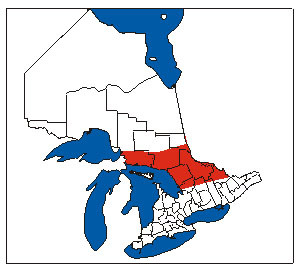 A Management Plan is being developed for the Algonquin Wolf (June 2008).